Intrigued by this, I immediately ran to my computer in the office and typed in search “cat photo” and “cat GIF”. And, my God, what I have found: a cats’ internet empire. Who would’ve thought that cats were such a popular web topic and image subject. I was shocked! I went from one web page to another, from one website to another formulating two thoughts in my head. The first one was more of a general wonder: why are people taking so many pictures of cats and pets more broadly. The other thought relates to a random amount of cuteness on these websites. I just couldn’t stop smiling, thinking how silly, adorable and charming these cat-stars are. In the spirit of sharing some interesting information (and images) with you, I’ll elaborate a bit on both of these thoughts. Why do people make cat GIFs? Believe it or not, there is a psychological, scientific evidence that proves that images of pets and animals make us happier. This research drew conclusions from a poll conducted in the US. Participants of the research were shown a series of photos of different everyday things. The results showed that people would almost exclusively smile to photos of cute animals. They had a particularly strong positive reaction to photos in which the animals were doing something surprising. The reactions can be explained with a fact that beautiful, cute, pleasant images trigger emotions such as: happiness, fulfillment and compassion. The researchers claim that these emotions are triggered in relation to the memory of the loved ones. These are the emotions we would have when looking at a family portrait – it triggers deep feeling of love, passion or happiness. Different research was done around the famous new born giant panda, Bao Bao at the Smithsonian’s National Zoo in Washington, D.C. In 2013. people were lined up to see the baby panda for the first time. Simon Rego, director of Psychology Training at Montefiore Medical Center/Albert Einstein College of Medicine explains this in a rather simple fashion. He says that the characteristics we find cute in animals (and the photos the animals) are the same characteristics we find in human babies. “Large head; rounded, soft, and elastic features; big eyes relative to the face; protruding cheeks and forehead; and fuzziness” are the features infants have. Thus, the amount of happiness and love we feel when we see our babies don’t stop even if we are not looking at our own. Scientists retain that the compassion for small, unprotected beings are drawn from the very roots of our evolution. We are programmed to have a nurturing reaction to small babies. Furthermore, research shows that the characteristics we find adorable are the same across nations of the world. There is a certain sense of compassion we feel when we look at those big sad eyes and those chubby cheeks. The inbreed instinct to rescue a small cute baby (of any kind) naturally occurs in both males and females whenever there is an infant in the picture. This is our answer: people inherit compassion instinct for their pets, even when they get older, because pets usually obtain the characteristics of a puppy. That’s why people are programmed to take care of it, keep it safe, love it, hold it and…take pictures of it as if they were a part of family. The popularity of GIFs has been rising for some time now. Hilarious replicas from movies, politicians dancing, cartoon characters popping up, animals talking etc. Among the enormous spectrum of topics, pets have positioned themselves pretty high on the GIF ladder. And, they extremely cute and funny! I made a selection of the ones that made me laugh the most. I hope you’ll enjoy them as well! This is the cat of our photographer who was inspired by the topic to make a couple of breezegrams of her own cat. Lucy is quite a model, don’t you think? With a fierce look and the moving ear she’s saying that she can hear everything! You don’t want to mess with this one. Need I say that this cat is a very busy one. Typing faster than speed, it must be on a deadline. Looks familiar? Sleepy head or annoying tail? This cat doesn’t seem to mind another cat’s tail though. Life is too short to let somebody ruin your nap, right? This is where our parent’s instinct is multiplied by three. Aside from being so cute with its big eyes, the cat is playing Peak a boo! It doesn’t get any cuter than this! Get on wiggle with it! This is a wiggle GIF you should always keep somewhere on your PC or smart phone for damage control. Whenever you are feeling down, sad or angry, open this image, put the music on, dance and laugh. It guaranteed to put a smile on your face. That’s all folks! I hope you’ve had a good laugh or at least that the cat GIFs put a smile on your face. 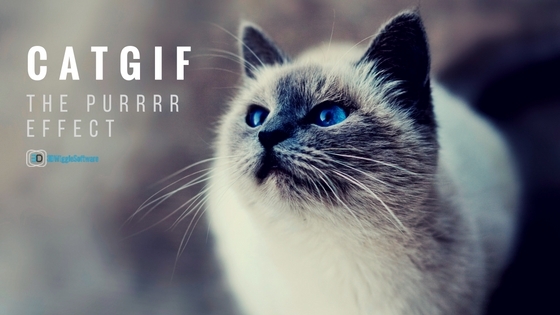 If you have some other cool examples of cat GIF, please send it to us, we will be more than happy to add it to the post.